Inspired by Morgan, the genius at PandaHead, I'm serving up a new weekly series here on Nothing-in-the-House--The Friday Pie Slice! Each Friday, I'll post a round-up of pie and pie-relevant stories, links, and news from the past week. Expect historical articles and recipes, food events and interviews, music and art. If you've got something you think might be a good fit for The Slice, don't hesitate to get in touch. Got your plate? Let's eat! 1st slice. Check out Phoebe Lawless of Durham's Scratch Bakery (previously featured on the pie blog here and here) in the latest issue of Garden & Gun with recipes for 3 late summer pies and lovely illustrations to boot. 2nd slice. My pal April McGreger of Farmer's Daughter Brand Pickles and Preserves shares her preserve-making philosophy on A Chef's Life. 3rd slice. "Some made good pies, some made good applesauce. And some, made really good cider." Orchardist Lee Calhoun talks about his preservation of "old-timey apples" on WUNC. 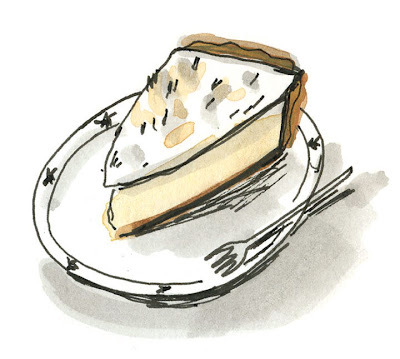 Labels: apple picking, pie places, Southern Foodways Alliance, The Friday Pie Slice, Washington D.C.
get out of here! love the new series; am already eagerly awaiting next friday's slice.